For those who believe that there must be a more agile and efficient way for people to get things done, here is a brilliantly discursive, thought-provoking book about the leadership and management process that is changing the way we live. In the future, historians may look back on human progress and draw a sharp line designating “before Scrum” and “after Scrum.” Scrum is that ground-breaking. It already drives most of the world’s top technology companies. And now it’s starting to spread to every domain where leaders wrestle with complex projects. 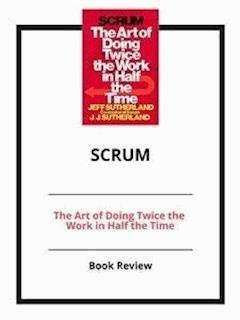 If you’ve ever been startled by how fast the world is changing, Scrum is one of the reasons why. Productivity gains of as much as 1200% have been recorded, and there’s no more lucid – or compelling – explainer of Scrum and its bright promise than Jeff Sutherland, the man who put together the first Scrum team more than twenty years ago. The thorny problem Jeff began tackling back then boils down to this: people are spectacularly bad at doing things with agility and efficiency. Best laid plans go up in smoke. Teams often work at cross purposes to each other. And when the pressure rises, unhappiness soars. Drawing on his experience as a West Point-educated fighter pilot, biometrics expert, early innovator of ATM technology, and V.P. of engineering or CTO at eleven different technology companies, Jeff began challenging those dysfunctional realities, looking for solutions that would have global impact. In this book you’ll journey to Scrum’s front lines where Jeff’s system of deep accountability, team interaction, and constant iterative improvement is, among other feats, bringing the FBI into the 21st century, perfecting the design of an affordable 140 mile per hour/100 mile per gallon car, helping NPR report fast-moving action in the Middle East, changing the way pharmacists interact with patients, reducing poverty in the Third World, and even helping people plan their weddings and accomplish weekend chores. Woven with insights from martial arts, judicial decision making, advanced aerial combat, robotics, and many other disciplines, Scrum is consistently riveting. But the most important reason to read this book is that it may just help you achieve what others consider unachievable – whether it be inventing a trailblazing technology, devising a new system of education, pioneering a way to feed the hungry, or, closer to home, a building a foundation for your family to thrive and prosper. Scrum is a new and improved way to do projects. It is designed to be evolutionary and adaptive rather than top-down and prescriptive. The convent ional way of doing product development is broken. The “Waterfall Method” – break a large project down into step-by-step chunks and schedule them on a Gantt chart – doesn’t work. Almost without fail, waterfall method projects fall behind schedule, go over budget and run the risk of generating products nobody wants or will pay for when completed. Scrum was developed in 1993 as a new and improved way to do projects. It is designed to be evolutionary and adaptive rather than top- down and prescriptive. Scrum was initially used with great success in the software industry but has now been used successfully in almost every industry across the board. Scrum draws on the advantages of the Toyota Production System and the OODA loop used in combat aviation. Scrum organizes around small teams – the most effective way to work – who prioritize what needs to be done and then run one- to two-week sprints to gain momentum and make everyone accountable. These teams stay organized by holding brief daily stand- up meetings where everyone can share tips, get help on challenges which crop up and be accountable. Top-down planning where the boss specifies what should be done and when (using color-coded charts) plain doesn’t work. All you end up with is an illusion of planning which fools noone. You should understand planning is useful but blindly following plans is stupid. ■ Instructions on what needs to be done and how it is to be done flows from the top of the organization to the bottom in a waterfall-style cascade. ■ Some planners spend months specifying what needs to be done and who will do it. ■ The planners produce magnificent looking color-coded Gantt charts showing who will do what and when. The only problem is what looks perfectly logical in those plans and charts invariably gets very messy when those detailed plans meet reality. Consequently, almost every project planned the conventional ways ends up being late and over budget. Furthermore, since you wait until the end to unveil to your end-user, chances are also pretty good what you end up developing will be something nobody wants or is prepared to pay for.